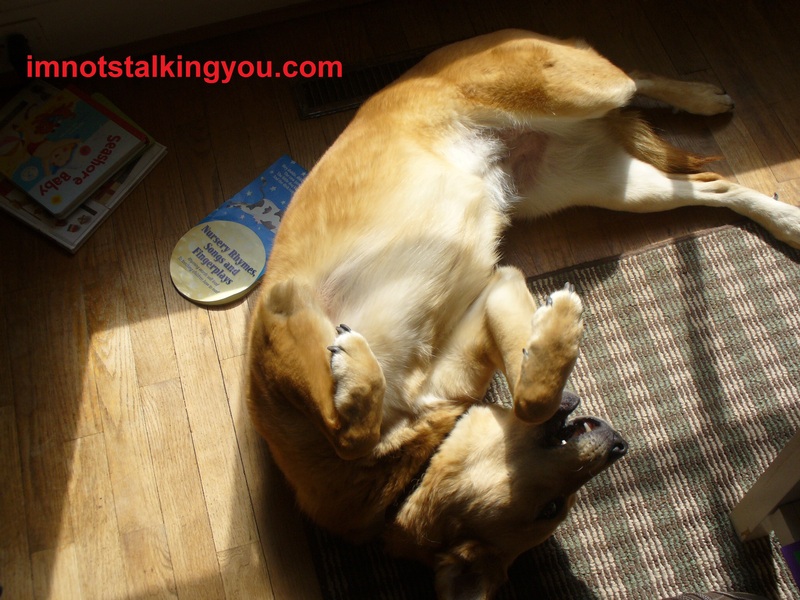 Acknowledgements | I'm not stalking you. I feel like there are people along the way who were instrumental at me getting to this point, and they probably are not even aware of it. I feel like now might be the time to give them shout-outs. It wouldn’t be possible to do them justice in the back of a paperback on the flat page–I require links and multi-media. I have already blogged about past teachers, such as dear Mrs. Raines who gave me my all-time favorite book way back in 2nd grade and dear Mr. Clark who put up with my crazy, even making me co-editor of the school newspaper when I never would have selected myself for such a job. I feel like I should also mention my asbestos friend. We were writing buddies in 8th grade, and we still are now. (And I’m not sure my subject matter has changed all that much 😉 ) Extra kudos to her for being my beta reader. And apparently Linus to my Charlie Brown. My best friend was fundamental to my development as well, although we enjoyed more art and drawing together than words. I don’t draw much anymore. But I love to do off-beat craft projects, such as Werecart creation and mystical giraffe repair. The skills I honed around her have now been funneled into logo, advertisement, and marketing materials. 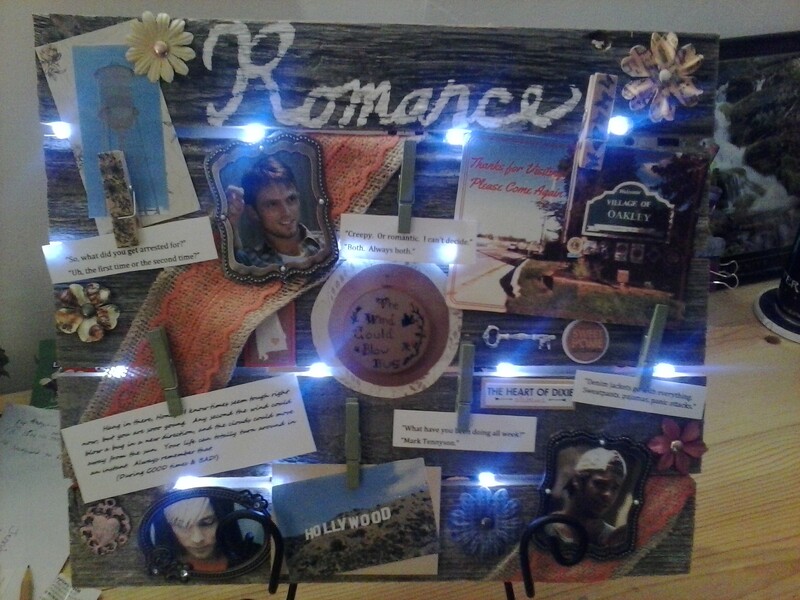 Mixed media table display for The Riley Sisters series. I was never a big reader (don’t be so shocked). I was always in love with television and the stories it told and the visual and aural (get your mind out of the gutter) experiences it could offer. If I grew up in today’s bounty of technology, I would probably be making programs on YouTube now rather than books. After all, Radio and TV production is what my bachelor’s degree is in. 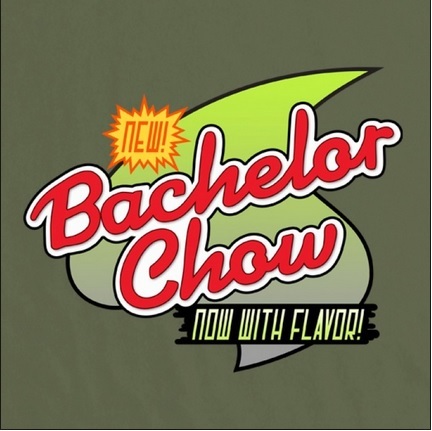 Somehow “bachelor’s degree” made me think of Bachelor Chow from Futurama. Speaking of which, I guess I should thank Steve in the Communications department of my alma mater for giving me A’s, and the delusion that I could create my own Riley Sisters series book teaser trailer. Blame him. It was great fun to make though! Click on the link below. I did have plans to become a writer. When I got my first big grown-up job, I even bought myself a Word Processor. (It was 1999. I didn’t know any better.) I sat in front of it, and realized writing was hard. So, I made a conscious decision to give up that dream… until years later when I would learn that I must write because I can’t not write. I should thank the now-defunct Borders, for providing me with invaluable book industry knowledge that I learned through osmosis from all those in cubicles near me (or those who were in cubes further away and were just loud). 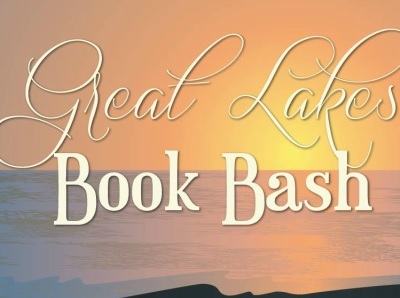 I got to experience first hand the evolving business of books, and the dire consequences of falling behind. I began my current venture with more awareness about the industry than many do. And thank you to my green-haired friend and my crazy friend, my co-workers along the way, who kept reminding me daily how much I loved to write. Whether it was a fresh-off-the-presses poem I wrote, one they composed, or just reciting song lyrics to one another, they were continuous reminders of how much the written word touches our lives every day. (If I could say that about Borders, they might still be in business.) Creativity, in any form, is essential to our lives on this planet. I didn’t really read, and find out what I liked to read, until I got my own apartment in June of 1999… and had no television for a month. I read a lot of books in that time. And I fell in love with Gaia from the Fearless series by Francine Pascal. For more on them, click here: https://imnotstalkingyou.com/2012/03/14/fearless/ While all the books are not cohesive (and I don’t even think they are all penned by Ms. Pascal), they drew me in and kept me hooked. I have been primarily a YA fan ever since. 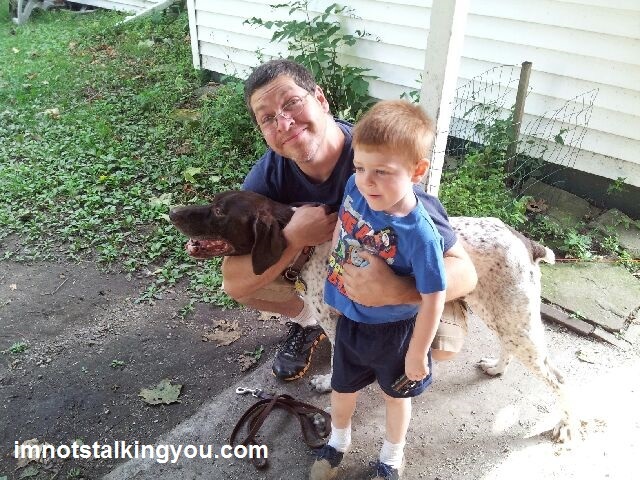 I would never have a blog if it wasn’t for my former co-worker Dane. One day he mentioned that he had one, and I was fascinated. Anybody could get one of those? And FOR FREE? I pondered it for several weeks before I took the leap. What would I write about? Would I run out of things? The answer to the second question is apparently “no”, as it is now 4 1/2 years later. And the blog, well, that kept me writing until a big idea struck me, and then I had a book. And another. And another. And it is all Dane’s fault, because he had a blog and I wanted to copy him. * It is one of my fondest memories of him. That, and the time I was in a meeting sitting next to him and I felt my in utero son kick for the first time. That was just a coincidence, I think. And thank you to my sister-in-law who, when I told her that I thought I might be writing a book after we had gone to a showing of the movie Safe Haven, didn’t laugh at me. She was one of the first people I told. That was The Wind Could Blow a Bug. Thank you to my dog Dave for letting me pet her furry long orange coat when the anxiety gets to be too much. She just senses when I need her. Except if she is sleeping really soundly–she is coming up on 13 years old, after all. She is never allowed to die. She knows this. I tell her every day. And to anyone else I may have forgotten– My head is stuffed full with fictional towns and characters. Sometimes that makes it hard to process life properly. *Note: This does not entitle Dane to any royalties from my burgeoning writing career. Posted in A day in the life, Entertainment Worship & Review, Unusual Poetry & Writing and tagged acknowledgement, book, Dane Jackson, Dave, English, Fearless, Francine Pascal, Gaia, Jennifer Friess, Mr. Clark, Mrs. Raines, Stephenie Meyer, thanks, trailer, Twilight, word processor, writing. Bookmark the permalink. Awe! Keep on trucking lady. Your doing great!